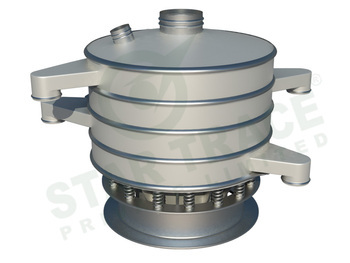 STAR TRACE Screen Separator is a unique particle size gradable separator designed for greater capacity per meter square of screening area & over size material discharge with relatively much less percentage fines than other screening machines. The motivation is through a unbalanced motor with a double extended shaft, fitted at both ends with eccentric weights .The top weight on the motor shaft rotates in a plane close to the center of the mass of assembly. Rotation of the top eccentric weights creates vibration in the horizontal plane, which causes material to move across the screen cloth to periphery increasing the horizontal throw, causing oversize material to discharge at a faster rate. The bottom eccentric weight rotates below the center of mass creating tilt on the screen giving vibration in vertical and tangential plane. Increasing the vertical component of motion, this promotes turnover of material on the screen surface helping maximum quantity of undersize material to pass through the screen. Rugged Springs placed over the circular motor base amplifies the vibration. The top weight on the motor shaft rotates in a plane close to the centre of the mass of assembly. Rotation of the top eccentric weight creates vibration in the horizontal plane which causes material to move across the screen cloth to periphery. Increasing the top eccentric mass, increases the horizontal throw, causing oversize material to discharge at a faster rate. The bottom eccentric weight rotates below the centre of mass, creating tilt on the screen, giving vibration in vertical & tangential planes. Increasing the vertical component of motion, this promotes turnover of material on the screen surface helping maximum quantity of undersize material to pass through the screen. The vertical motion also minimizes blinding of screen by "near size" particles. The tangential component of motion is controlled by the angle of lead given to bottom weights with relation to top weight. Variation in lead angle controlled the spiral pattern of material travel over the screen cloth. Speed & flow pattern of material travel over the screen cloth can be set by the operator for maximum throughout & screening efficiency for any screen able product, wet or dry, coarse or fine, heavy or light, hot or cold. Typical material passes rapidly through the screen during its travel to the periphery. The over size material get continuously discharged through a tangential outlet.